فراهی, گلاره, خداشناس, سعیدرضا, علیزاده, امین, ضیایی, علی نقی. (1396). کاربرد روش تسریع به منظور بهبود هم‌گرایی حل‌گرهای غیرخطی در حل معادله ریچاردز به روش حجم محدود. نشریه آبیاری و زهکشی ایران, 11(4), 517-527. گلاره فراهی; سعیدرضا خداشناس; امین علیزاده; علی نقی ضیایی. "کاربرد روش تسریع به منظور بهبود هم‌گرایی حل‌گرهای غیرخطی در حل معادله ریچاردز به روش حجم محدود". نشریه آبیاری و زهکشی ایران, 11, 4, 1396, 517-527. فراهی, گلاره, خداشناس, سعیدرضا, علیزاده, امین, ضیایی, علی نقی. (1396). 'کاربرد روش تسریع به منظور بهبود هم‌گرایی حل‌گرهای غیرخطی در حل معادله ریچاردز به روش حجم محدود', نشریه آبیاری و زهکشی ایران, 11(4), pp. 517-527. فراهی, گلاره, خداشناس, سعیدرضا, علیزاده, امین, ضیایی, علی نقی. کاربرد روش تسریع به منظور بهبود هم‌گرایی حل‌گرهای غیرخطی در حل معادله ریچاردز به روش حجم محدود. نشریه آبیاری و زهکشی ایران, 1396; 11(4): 517-527. حل معادله ریچاردز با بکارگیری از روش ضمنی حجم محدود منجر به تولید یک سیستم معادلات غیرخطی شده که دقت حل آن تابعی از نوع روش حل معادلات غیرخطی است. روش تکراری پیکارد یک روش قوی، در عین حال با سرعت هم­گرایی خطی است، روش نیوتن رافسون، درصورتی­که حدس اولیه در بازه­ای مناسب قرار بگیرد علاوه بر دقت بالا، از سرعت هم­گرایی بیش­تری برخوردار است.با این حال به­دلیل حجم قابل توجه محاسبات ناشی از حل ماتریس ژاکوبین و مشتقات جزیی در هر تکرار، معمولا به عنوان یک روش محبوب در حل سیستم­های غیرخطی در فضای بیش از یک بعد درنظر گرفته نمی­شود. در این مقاله، به منظور کاهش حجم و زمان محاسبات تلفیق دو الگوریتم پیکارد و شبه­نیوتن به همراه روش تسریع برویدن معرفی شد. ازاین­رو هدف از این تحقیق در ابتدا مطالعه تاثیر تلفیق الگوریتم­های خطی­سازی به­همراه روش سریع برویدن بر زمان شبیه­سازی معادله دو بعدی ریچاردز و سپس بررسی دقت روش عددی حجم محدود ضمنی در حل این معادله است. بدین منظور از پارامترهای هیدرولیکی یک نمونه خاک لومی رسی شنی با شرایط مرزی هد ثابت و رطوبت اولیه معادل با رطوبت باقی­مانده، استفاده شد. مقایسه نتایج سه الگوریتم خطی­سازی نشان داد، در صورتی­که شاخص هم­گرایی تغییر حلقه الگوریتم پیکارد به الگوریتم شبه­نیوتن درست انتخاب شود، روش پیکارد/شبه­نیوتن تاثیر قابل توجهی در کاهش زمان محاسبات نسبت به روش پیکارد دارد. درصورتی­که اعمال روش برویدن تاثیر چشم­گیری در کاهش زمان از خود نشان نمی­دهد. 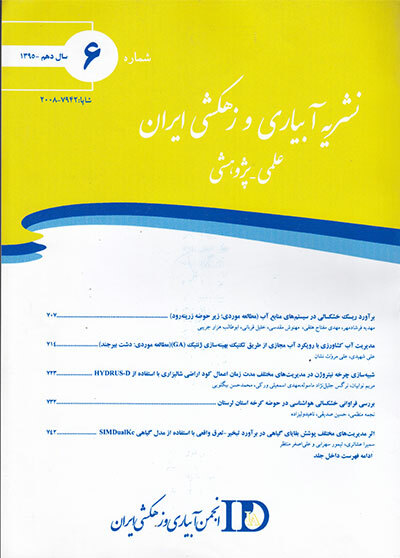 در ادامه نتایج مدل عددی با استفاده از الگوریتم پیکارد/ شبه­نیوتن/ برویدن در قالب نیم­رخ مکش با حل تحلیلی معادله ریچاردز به روش واریک، مقایسه شد. نتایج نشان داد که روش عددی حجم محدود ضمنی، از دقت بالایی در برآورد تغییرات مکش در خاک برخوردار است، به­طوری­که خطای جذر میانگین مربعات مدل عددی در مقایسه با حل تحلیلی واریک معادل 0001/0 سانتی­متر محاسبه شد. Groundwater flow in variably saturated soils is described by the nonlinear Richards equation. The solution of Richards equation using implicit finite volume method produces a system of nonlinear equations, whose resolution demands for the application of an appropriate nonlinear systems solvers, such as the Picard or the Newton schemes. The Picard iterative technique is a robust method, which is convergent at a linear rate while the Newton-Raphson (Newton) method can produce accurate results when using a suitable initial guess and converge at a much higher rate. But since the computational cost of Newton method, due to the calculation of the formal inversion of Jacobian Matrix and partial derivatives is high, this method doesn’t seem to be demanding for the problems with more than one dimension. In this paper, to reduce the cost and time of Newton’s iterations, the mixed form of Picard and quasi-Newton followed by the Broyden method is employed. Therefore the purpose of this paper is first to investigate the effect of three linearization methods on the time of calculation and then to study the accuracy of the proposed implicit finite volume method for solving two dimensional mixed form of Richards equation. For this, data from a test case for a sandy clay loam soil with constant head as a boundary condition and initial moisture close to residual moisture was used. Comparison of the three linearized methods showed that for well selected convergence criterion, Picard/quasi Newton algorithm can dramatically reduce the time of calculations and number of iteration when compared to Picard scheme. Broyden method has a small effect on reducing time of calculation comparing with Picard/quasi Newton method. The performance of the proposed numerical method was then studied for two dimensionalmovement of water in a variably saturated soil using Picard/quasi Newton/Broyden method in comparison with the Warrick’s analytical solution. The results showed that the implicit finite volume method produced a good fit to the analytical solution, so that the RMSE=0.0001 was calculated between the models results and analytical solution on Richards equation. Bevilacqua,I., Canone.D and Ferraris.S. 2011. Acceleration techniques for the iterative resolution of the Richards equation by the finite volume method. International Journal for Numerical Methods in Biomedical Engineering. 27.8: 1309-1320. Broadbridge,P and Rogers,C. 1990. Exact solutions for vertical drainage and redistribution in soils. Journal of Engineering Mathematics. 24.1: 25-43. Broyden,C.G. 1965. A class of methods for solving nonlinear simultaneous equations. Mathematics of Computational Geosciences.19: 577-593. Burden,R.L and Faires,J.D. 2011. Numerical Analysis, Richard Stratton. Caviedes-Voullieme,D., Garcia-Navarro.P and Murillo.J. 2013. Verification, conservation, stability and efficiency of a finite volume method for the 1D Richards equation. Journal of Hydrology.480: 69-84. Durick,A.M. 2004. Analysis and improvement of the nonlinear iterative techniques for groundwater flow modelling utilising MODFLOW. Master thesis.Queensland University of Technology. Huang,K., Mohanty,B.P., Leij,F.G and Van Genuchten,M.T. 1998. Solution of the nonlinear transport equation using modified Picard iteration. Advances in Water Resources. 21.3: 237-249. Fassino,C., Manzini,G. 1998. Fast-secant algorithms for the non-linear Richards equation. Communications in Numerical Methods in Engineering. 14.10: 921-930. Lehmann,F., Ackerer,P. 1998. Comparison of Iterative Methods for Improved Solutions of the Fluid Flow Equation in Partially Saturated Porous Media. Transport in Porous Media. 31.3: 275-292. Manzini,G and Ferraris,S. 2004. Mass-conservative finite volume methods on 2-D unstructured grids for the Richards’ equation. Advances in Water Resources. 27.12: 1199-1215. Mehl,S. 2006. Use of Picard andNewton Iteration for Solving Nonlinear Ground Water Flow Equations. Ground Water. 44.4: 583-594. Misiats,O and Lipnikov,K. 2013. Second-order accurate monotone finite volume scheme for Richards’ equation. Journal of Computational Physics. 239: 123-137. Mualem, Y. 1976. A new model for predicting the hydraulic conductivity of unsaturated porous media. Water Resources Research. 12.3: 513-522. Panday,S and Huyakorn,P.S. 2004. A fully coupled physically-based spatially-distributed model for evaluating surface/subsurface flow. Advances in Water Resources. 27.4: 361-382. Panday,S., Huyakorn,P.S., Therrien,R and Nichols,R.L. 1993. Improved three-dimensional finite-element techniques for field simulation of variably saturated flow and transport. Journal of Contaminant Hydrology.12.1: 3-33. Paniconi,C., Aldama,A.A and Wood,E.F. 1991. Numerical evaluation of iterative and noniterative methods for the solution of the nonlinear Richards equation. Water Resources Research. 27.6: 1147-1163. Paniconi,C and Putti.M. 1994. A comparison of Picard and Newton iteration in the numerical solution of multidimensional variably saturated flow problems. Water Resources Research. 30.12: 3357-3374. Philip,J.R. 1967. Theory of infiltration. Advances in Hydroscience.1967.5:215-305. Phoon,K.K., Tan,T.S and Chong,P.S. 2007. Numerical simulation of Richards equation in partially saturated porous media: under-relaxation and mass balance. Geotechnical and Geological Engineering. 25.5: 525-541. Sadegh Zadeh,K. 2011. A mass-conservative switching algorithm for modeling fluid flow in variably saturated porous media. Journal of Computational Physics. 230.3: 664-679. Tracy.F. 2010. Testing computational algorithms for unsaturated flow. The Open Hydrology Journal. 4:227-235. Tocci,M.D., Kelley,C.T., Miller,C.T and Kees,C.E. 1998. Inexact Newton methods and the method of lines for solving Richards' equation in two space dimensions. Computational Geosciences. 2.4: 291-309. Van Genuchten,M.T. 1980. A Closed-form Equation for Predicting the Hydraulic Conductivity of Unsaturated Soils. Soil Science Society of America Journal. 44.5: 892-898. Walker,H., Woodward,C., Yang,U. 2010. An accelaration fixed-point iteration for solution of variably saturated flow. In: J. Carrera (Ed)Proceedings of XVIII International Conference on Water Resources, Barcelona. (available online at http://congress.cimne.com/CMWR2010/Proceedings/Start.html). Warrick,A.W., Lomen,D.O and Yates,S.R. 1985. A Generalized Solution to Infiltration1. Soil Science Society of America Journal. 49: 34-38.